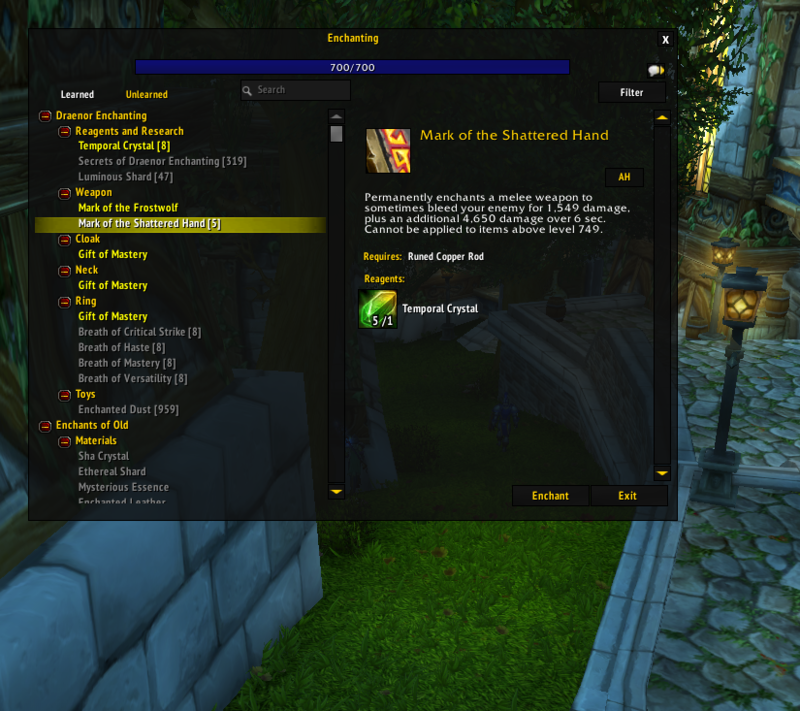 Formule : Tome des illusions (Draenor) is sold by the Enchanter's Study vendor for 1x Secret d'enchanteur de Draenor. One typo I noticed - under Relics, Fibrille immaculée, the formula is erroneously listed as Technique : Marque aquatique. Mot de polyvalence (Rank 3) is obtained at Honored with Tisse-Rêves not Souffrenuit. I found in Dalaran sold by Ildine Tristelance, Formule : Fracas tellurique. I had Formule : Enchantement de collier (Marque de la peau lourde) drop from mobs, but because I am not Exalted with Dreamweavers, I can't learn it. It's sitting in my bank on my enchanter. Hoping Blizzard changes it when they realise how pointless it is to have it as a world drop when you can't learn it without the rep to buy it anyway. So Stupid. NPC link in the guide is incorrect. This is the right one: Ildine Tristelance the one linked in the guide leads to the NPC in DWP/Karazhan.